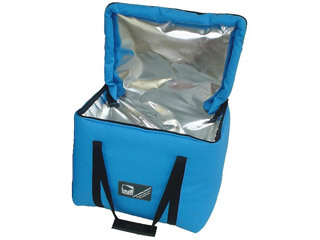 A very high quality, durable 20 litre capacity thermal carry bag with extremely high thermal performance. Used for the delivery of temperature controlled products (hot or cold). Can be used with gel packs to extend thermal performance or if being opened and closed regularly. Often used by district medical staff when carrying out vaccinations within the community, or to courier pharmaceutical, medical, blood products or perishable samples between locations. Also used for hot food delivery. Able to keep products within a required temperature range for several hours depending on use and whether gel packs are used. Can be branded with organisation logo and colour.